Radishes (Raphanus sativus) are taproot cruciferous vegetables belonging to the brassicaceae family. Containing many classes of biologically active phytochemicals and being an excellent source of vitamin C and a very good source of folate, radishes exhibit potent antioxidant properties, support cardiovascular and immune system health, support healthy blood glucose and cholesterol levels and promote healthy skin, hair and nails. Radishes are also a good source of protein, dietary fiber, manganese, magnesium, phosphorus, calcium, niacin and Vitamin B6, as well as containing smaller amounts of other important B vitamins. The sprouts of the radish taste similar to radish but are not as spicy. They contain a higher concentration than the mature radish taproot of its main bioactive compounds; anthocyanins (potent flavonoids), phenolic compounds, and glucosinolates and isothiocyanates. These compounds help to promote the overall health of the body and have been found to enhance the antioxidant defense mechanism, modulate glucose uptake and energy metabolism, reduce glucose absorption in the intestine, stimulate small bowel mobility and stimulate the flow of bile. 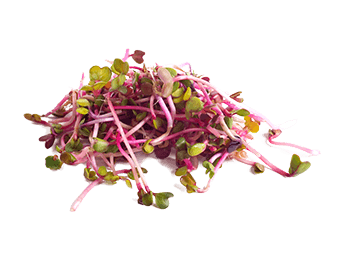 Additionally, polyunsaturated fatty acids are the predominant fatty acids in radish sprouts, nourishing the body by assisting in the formation and maintenance of healthy cell membranes, providing antioxidant and anti-inflammatory benefits, cardiovascular support, regulating blood glucose levels and providing nervous and immune system support.